In sync with my habit of figuring things out as I go, I woke up early Tuesday morning to ‘baidu’ (China’s ‘google’ equivalent) the address of the farm I had made plans to visit in Liangzhu (良渚) village. I had been in contact with the farm manager, Chen, for the past few weeks, and knew that I could get there by bus, but after studying the map I realized in just two hours I could make it there by Hangzhou’s bus line, and wouldn’t even need to go through one of the long-distance bus stations. Which also peaked my curiosity about what a farm would be like that was within such close proximity to the city’s urban core (just 15 kilometers from the city limits). 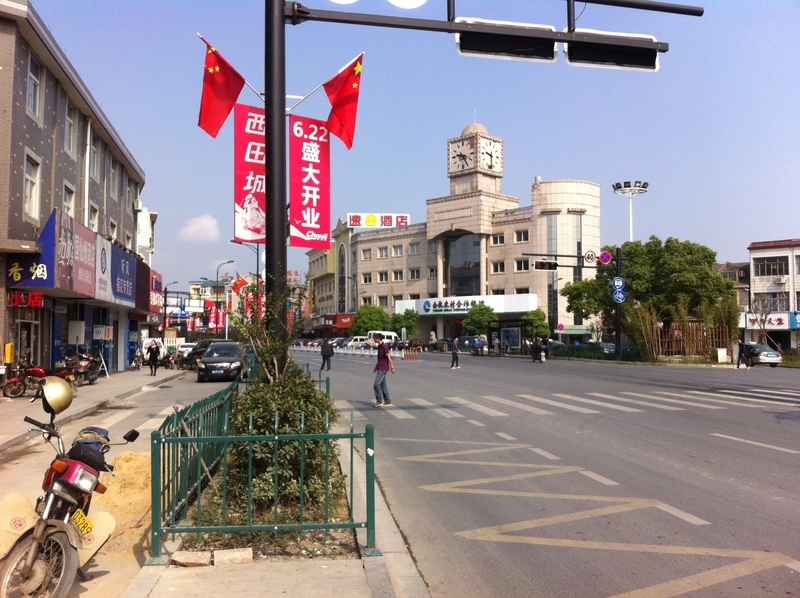 About two and a half hours later I stepped off the bus in Liangzhu’s town square, and was almost immediately greeted by some curious locals anxious to help me find me way. I showed them the address, and some said it was close enough to walk while others said they didn’t know it, so I called Chen and he said he would be over in five minutes to pick me up. A cell phone shop across the street was blaring some old lady gaga song, competing for airwaves with whomever the House music aficionado was at the neighboring electric bike shop. Even though it was a tuesday afternoon, the streets were full because it was National Day, and the first day of a 7-day holiday. 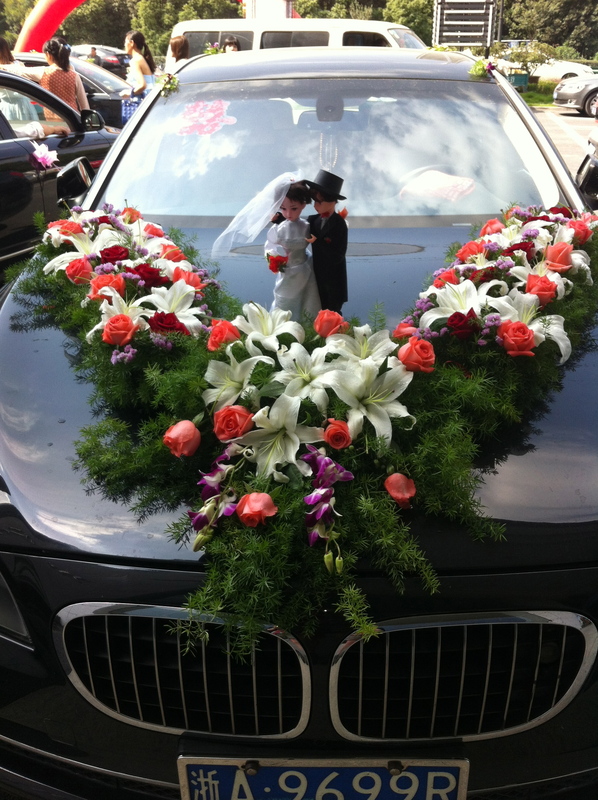 Chen pulled up in a gray sedan, and I hopped in the passenger seat beside him. He said he would first show me his farm and the main office. About five minutes down the street we began passing fields of various vegetables, which he said were all his, along with pigs and ducks he raises. As we continued driving down the road he said that all of these fields are part of his farm, and that he rents the land from the other farmers in the village. I said I had learned that China has a policy where every rural citizen gets a plot of land from the government, and he said yes, but that he rents the land these farmers were allocated because they have found work in Hangzhou city. Chen pulled into his farm’s parking lot, and gave me a quick tour through the rows of greenhouses which stretched as far as I could see before showing me the pig pen. He said that in China his farm is very big, but compared to the farms in the US it is tiny. I said yes, but that in the US these big farms are not so good because they produce a lot of waste, and he pointed at some tarp on the ground and said his farm produces waste too. After taking a walk through some of the greenhouses we headed over to the office. He explained that there are eighty people that work on his farm , but because of the holiday they are all back with their families and will not be working this week. In the office he showed me through the lobby to a meeting room with two long furnished tables. All along one wall were bookshelves with plaques– each year they have won awards from the government, and there were even two plaques from the US, where they have now begun exporting crops. 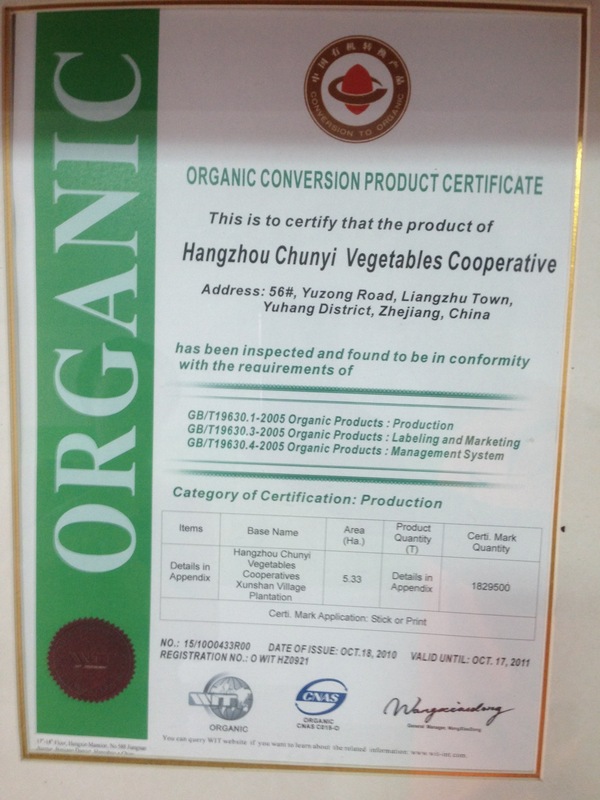 One was their organic certification by CNAS and WIT, China’s two organic certification agencies. As we walked back to the car I said that even though people were on vacation this week I really wanted to work hard and would be willing to do whatever was needed, but he said it wouldn’t be necessary, that he just wanted me to see a new place and have fun. As we drove off he said that the day after tomorrow he was getting married, so he was going to be kind of busy. I couldn’t help but start to laugh in surprise and shock– how could he have been ok with me coming to visit the same week he was getting married– or at least failed to mention it? I thought there was no way and I just must have confused the word for ‘wedding’ with ‘celebration’ and he was just referring to some National Day celebration that was going on. I tried to ask what kind of special celebrations they have planned and how many people would be there, hoping his response would help clarify, but he just said more than a hundred people would be there. 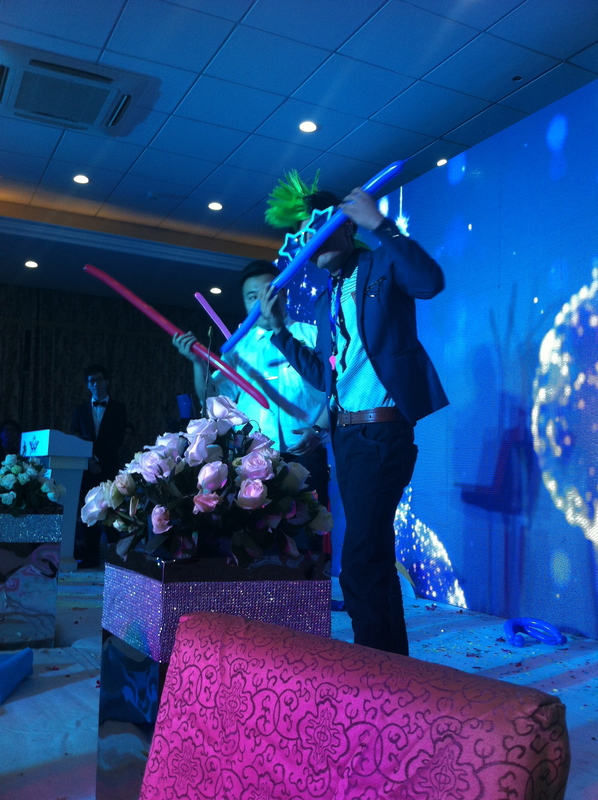 I decided it probably meant a celebration, but Chinese weddings can also be huge affairs, so I still really couldn’t really be sure. After he helped me settle into my room he said he would be back at 6pm to bring me to his wife’s mother’s house for dinner. Which I thought definitely settled the wedding vs. celebration question. 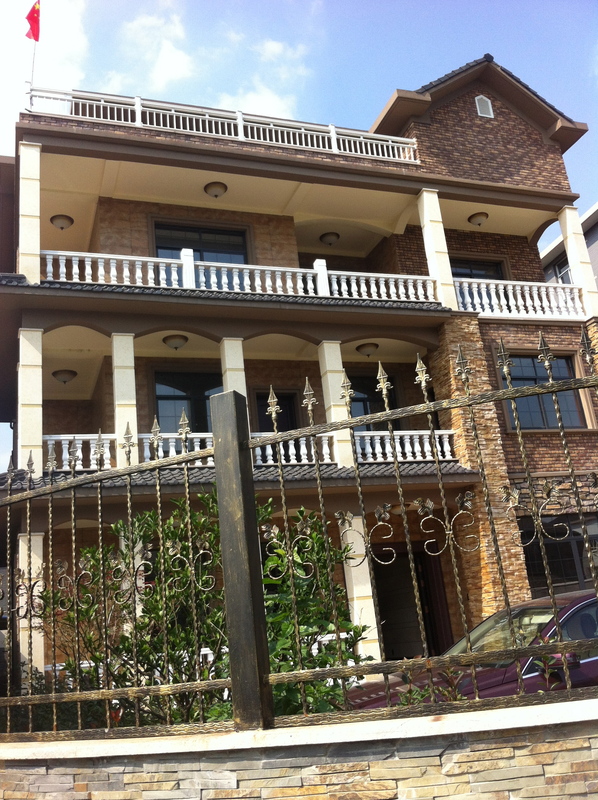 This is Chen’s Mother-in-law’s new house. Just behind it is where her family currently lives. Eventually they will occupy both. A few hours later we met downstairs and hopped back in the car, and after a quick ten minute drive to the outskirts of town we pulled up in front of a stone and cement 3-story house. It was by far the nicest house I have seen in any village in China. I later found out that a new home had just been constructed right in front of the old one. 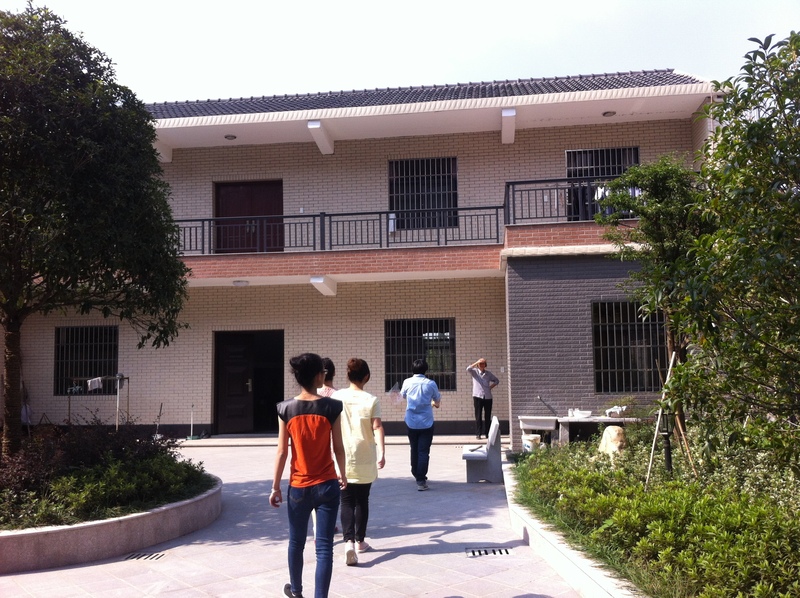 Chen’s wife’s home was similarly composed of two separate structures with a courtyard in the middle. I heard later that while these homes have four or five floors, everyone just uses the first and second floors and the other floors are extra rooms and for storing things. After entering through the front home (pictured above), we passed through a courtyard to the second home. Chen’s wife’s mother was waiting out front, and they showed me inside to where dinner was already set out on the table. Chen introduced me to his wife and her sister, along with about five other men and another woman who were all related in some way or other. 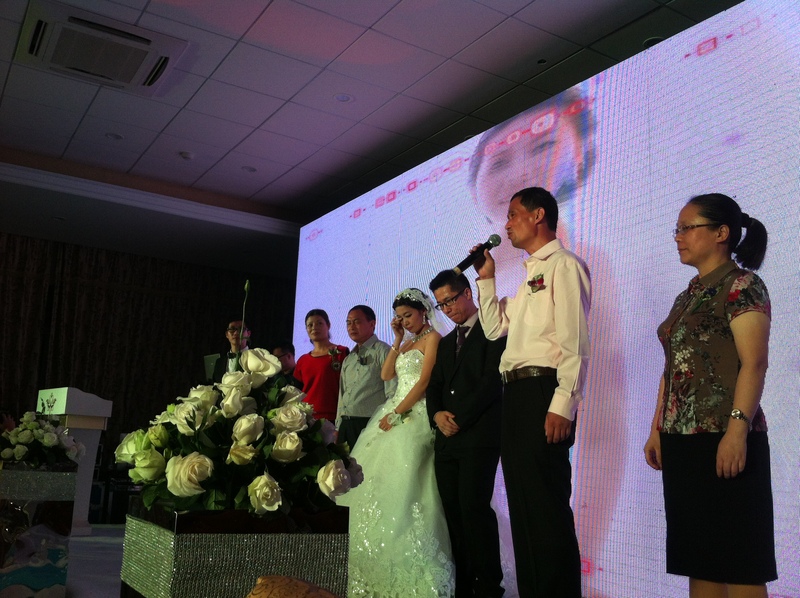 As Chen introduced his wife he said they were expecting a baby (I wouldn’t have been able to tell). Chen and his wife had already eaten so they sat on the sofa adjacent to the table as the rest of us sat down to eat. Most of the men were chatting in Liangzhuhua, the local dialect, and I broke into the conversation now and then to ask if they all grew up in Liangzhu (yes) and if they all worked together on the farm (no). They asked me questions now and then about where I was from, and as they offered me food they said I didn’t need to worry about being so polite (when I’m nervous I have a habit of over-thanking to the point that it gets ridiculous). I decided to visit a farm so close to the city because I knew it would most likely provide a counter-perspective to the glimpse of the more isolated villages I had intentionally sought out when I was here before. If you compare some of the photos from the homes of my previous field visits, you’ll see that it definitely did just that. When I was here in 2010, the primary goal of my field research was to understand if rural farmers wanted to take advantage of a 2008 farmer-to-farmer land-transfer policy that was encouraging rural residents to integrate their collectively-allocated “noodle” plots and pursue full-time work in nearby towns or cities. The policy reveals the complexity of teh rural land-use issue in China because it’s three-pronged goals were ostensibly in the interest of farmers and the state: 1) to promote social mobility in the countryside; 2) to encourage productivity and more efficient grain production, and 3) to mitigate land conflicts with local officials by limiting their involvement in land transactions. There were generally two contrasting academic perspectives regarding the land-transfer policy: the ‘optimists’ believed that limiting local officials’ involvement in land transfers while encouraging a redistribution of rural land would increase investment in agriculture, reduce the income gap between rural and urban workers, and stimulate domestic demand. The ‘pessimists’ believed the policy could lead to a monopoly of vast land resources in the hands of a small number of landlords and millions of landless farmers would lead to widespread urban slums and unemployment. The conclusion of my 2010 thesis was that the land-transfer policy wasn’t going to work because farmers would rather hold onto their collectively-allocated farm plots as a basic source of security and subsistence rather than take the risk of transferring it to another farmer and permanently moving to nearby towns and cities where they might be left a landless peasant with only informal job opportunities. This family contradicts my conclusion that farmers would prefer to pursue non-agricultural opportunities while holding onto their land as a source of subsistence and security. Not only are they successfully farming full-time, but other farmers in the village have made the decision to rent their land to this family and pursue full-time work in Hangzhou. The village’s proximity to the city obviously makes this a more viable option than for the families in the more isolated villages I visited before. For the families that rent their land to Chen and are working in Hangzhou, it would be interesting to find out whether they have been able to find formal or informal labor opportunities. It may speak to the country’s rising inequality, and reflect the pessimist’s view of the land-transfer policy– that it may lead to a monopoly of vast land resources in the hands of a small number of farmers– if Chen’s family has been able to do so well after acquiring so much land while other families are potentially pursuing insecure jobs in the city. On the drive back that night I asked Chen how he had met his wife, and he said that they were at a stadium and he was playing football while she was running around the track. I said that I also liked to run, and he said that tomorrow afternoon he would take me to go running, but that the day after that would be his wedding (there was no mistaking this time) so he would be a little occupied. I tried to suppress my shock and asked what I could prepare to bring, and he said nothing, I just needed to bring my mouth and be ready to eat. The morning of the wedding Chen’s friend knocked on my door to let me know it was time to leave, and along with a few other friends we all piled into a car and drove about 10 minutes over to Chen’s parent’s home. Various family members were mingling downstairs, but we all ascended three flights to where Chen’s best men were gathered watching a soccer game on television. 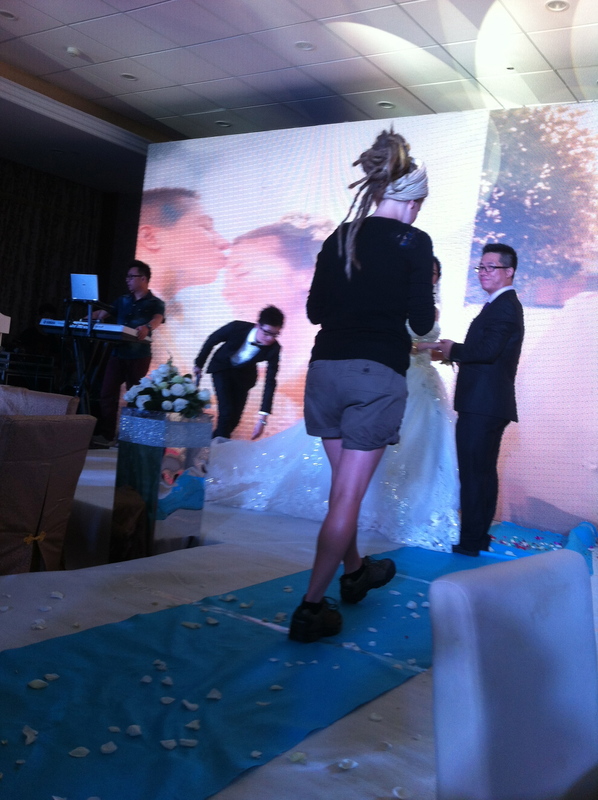 I stood off to the side with the wife of one of Chen’s friend’s, and we made small talk until we heard fireworks going off outside that signaled the arrival of the bride and groom. Everyone gathered again out on the balcony, but soon began pouring outside into their various vehicles, and we all took off to a restaurant just a few minutes away. I rode with Chen’s friends, and after we had entered I hung back, unsure of where I should sit, but Chen caught my eye, led me up to the front of the room, and sat me at the table of his bride and her bridesmaids. After lunch I followed his bride’s younger sister, Qiqi, back to the house where everyone was resting after what had obviously been a long morning getting ready. After an hour or so Chen called me into a separate room with one of his best men who could speak some English, and between the two of them they asked me if I would be the ring bearer in their wedding ceremony that night. I was honored and obviously accepted, but was also ridiculously nervous. 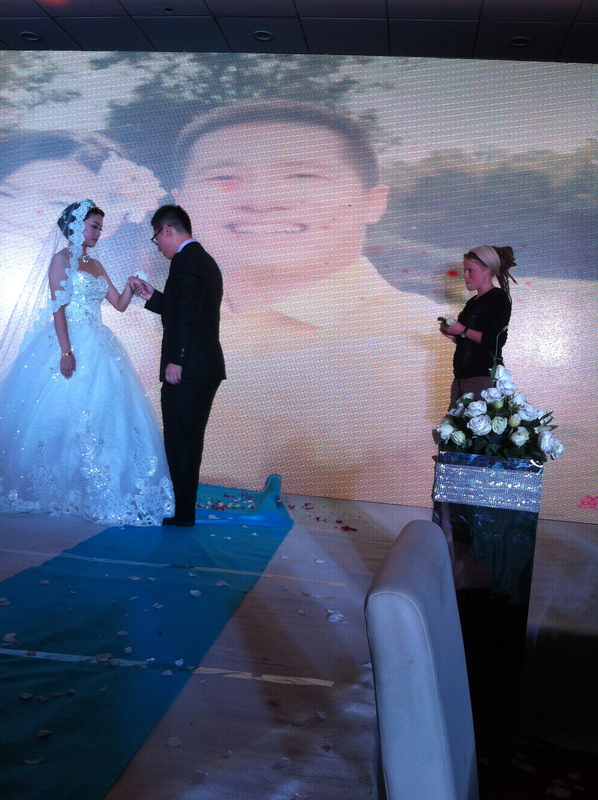 I’ve been to a few Chinese weddings receptions (they can go on for days with meals first at the groom’s family’s home and then the bride’s), but have never seen an actual ceremony. That night there were definitely more than a hundred people gathered in a private room of the same hotel where we had lunch. When the time came for the ceremony to start, Chen stood up on stage first, and waited for his bride to enter with her father. When they reached the edge of the platform runway, Chen walked out to meet them, kneeled down, made a speech and asked if she would be willing to be his wife. She said she was willing, took his arm, and together they walked the rest of the way down the runway. 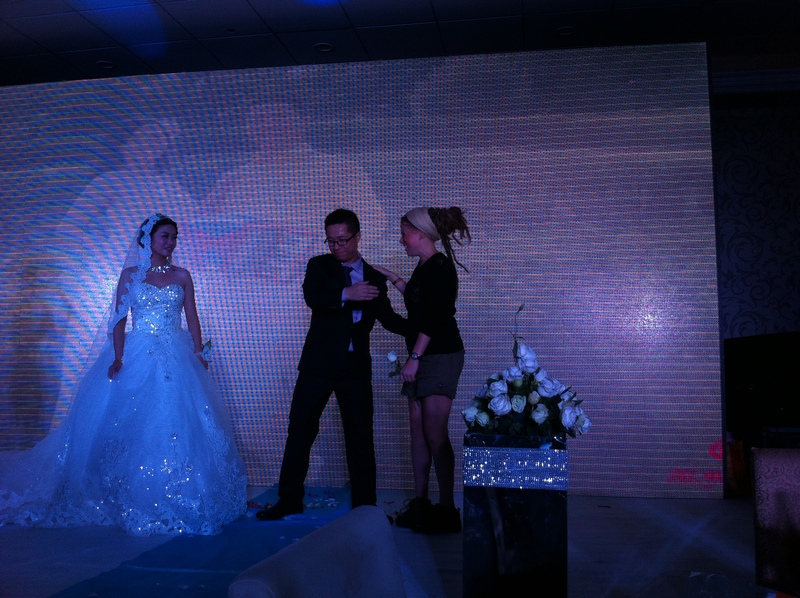 Then I walked down the runway with the rings on the stem of a rose. in hindsight, I walked way too quickly, but combined with being super nervous I’m just a naturally fast walker. Also, because I thought I was going to be spending the week on a farm, all I brought were my hiking boots. 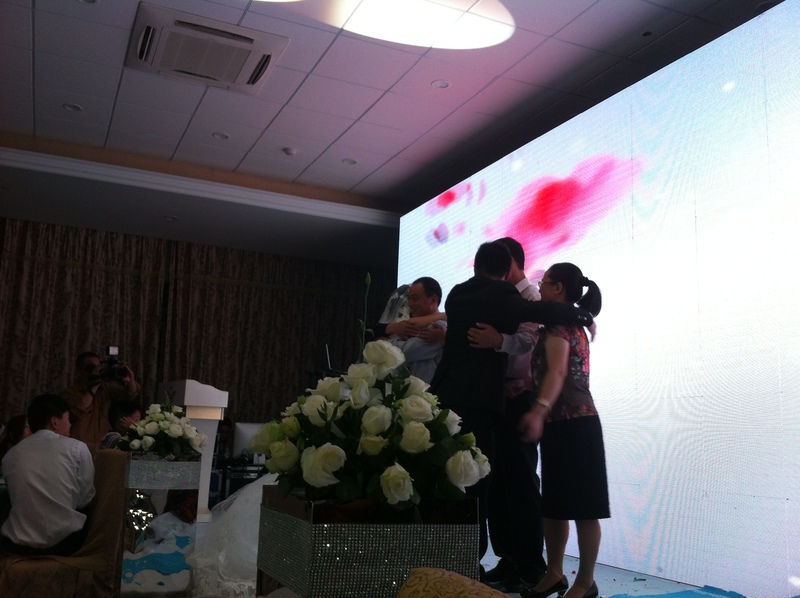 After I gave them the rings, Chen’s dad came up and made a speech, then Chen made a speech, then his wife’s Dad made a speech, and then their parents all came up on stage and hugged each other. It was great. 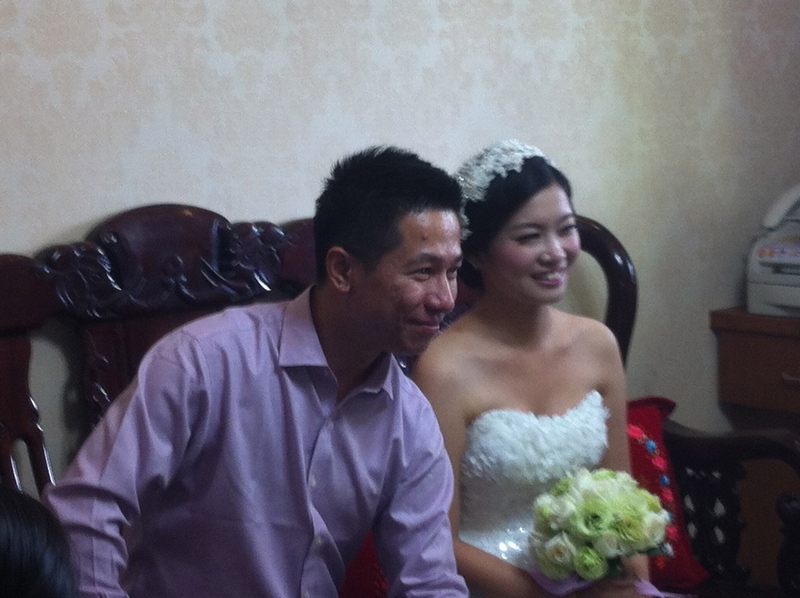 The following day Chen’s friend came and picked me up and drove me over to where everyone was now gathered at the bride’s home. After lunch was finished I accompanied Chen’s wife, Qiqi, and a few friends just across the street to her mother’s house. We made our way out back to the garden that includes a gazebo and fish pond to go for a boat ride. Two of the other girls started off paddling, but soon we all began laughing as they readily confessed they did not know how. I offered to take over, even though I wasn’t much better. 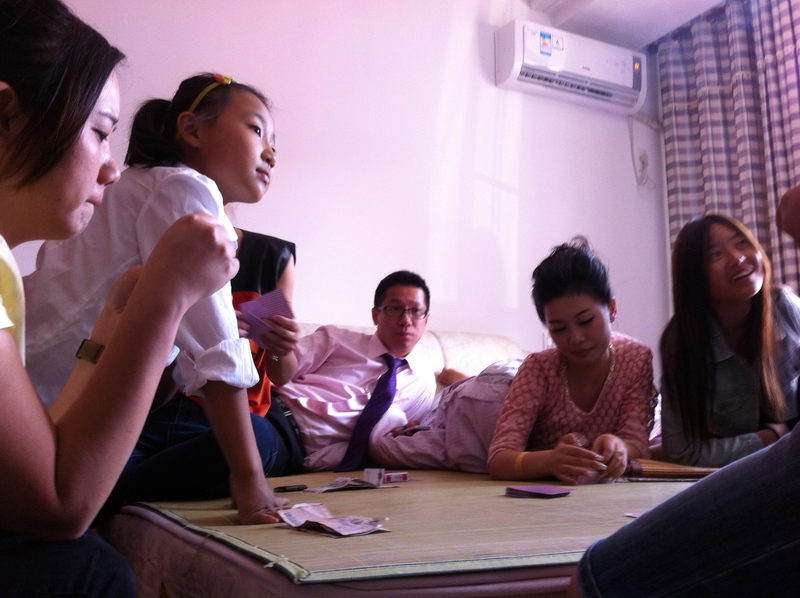 Later that afternoon Chen, his wife, and a few of the best men and bridesmaids gathered in one of the extra rooms upstairs to gamble. After dinner that night, I thanked Chen and his family for so graciously welcoming me into their home. 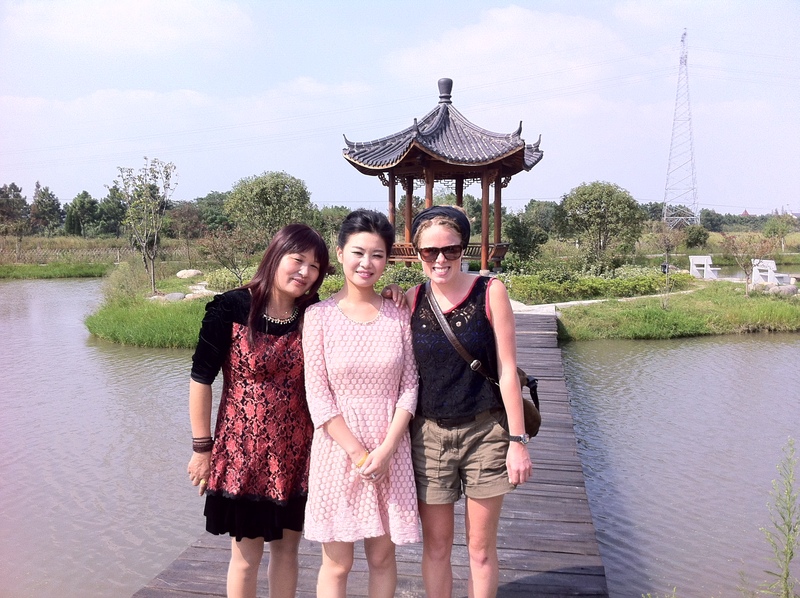 They welcomed me to come back, and we made plans to see each other again in the spring. Chen’s friend who had brought me over in the morning drove me back to my room, and on the way we chatted (I had become much more talkative after being coerced into joining the best men and bridesmaids in drinking baijiu). After I explained that I was interested in China’s rural development, he said that the US has a better development system than China because in the US there is more technology. I replied that yes it is different, and in the US there is a lot of technology, but there are still a lot of people without jobs and right now our economy is not doing so well. He said that in China there is a lot of reliance on human labor, but that he thinks the system in the US is better. After dropping me off that night I caught the bus back to Hangzhou early the next morning. It will be a few months before I have another break from classes to set out to my next field site, but in the meantime I’ll be adding periodic updates from the rest of my 2010 adventures. This entry was posted in Zhejiang Province and tagged cooperatives, organic farming, rural China, rural land-use, wwoof china, Zhejiang. Bookmark the permalink. Hi lovely. You are an excellent writer and your stories are very entertaining! Go Elena!